On Wednesday, May 26, Dryden High School students visited the Experimental Lakes Area (ELA) to observe real and authentic ecological science. The group consisted of Mr. Mitchell’s grade 12 Biology class, Mr. Darling’s grade 11 Environmental Science class, and Mrs. Jones’ Grade 12 science class. The ELA is a unique world class research station where whole-lake ecosystem experiments can be conducted. It is located 80 km west of Dryden. 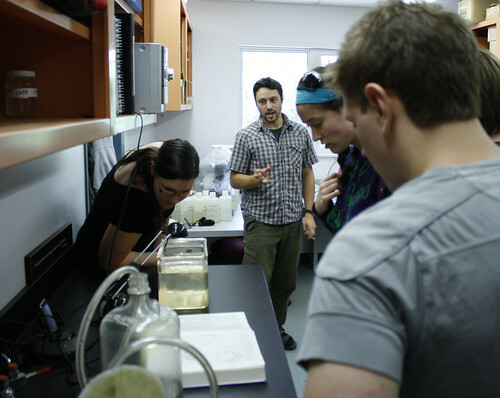 and the invertebrates lab for the capture and study of aquatic invertebrates. All students who participated had their eyes opened to career and education paths in the ecological sciences. The DHS Science department commits itself to authentic, hands-on learning activities such as the ELA field trip.